Billy and Blaze by C.W. Anderson is the first book in the classic series. It tells the story of Billy who loves horses. Billy is overjoyed when he receives a horse, Blaze, as a birthday gift. Billy and his pony understand each other at once and quickly develop a special bond. Billy loves riding Blaze through the green woods. He learns to jump with Blaze, and together they even rescue a dog named Rex who becomes a friend to them both. 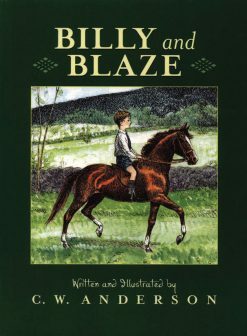 Billy enters into a horse show with Blaze, and together Billy and his best friend compete for first prize! 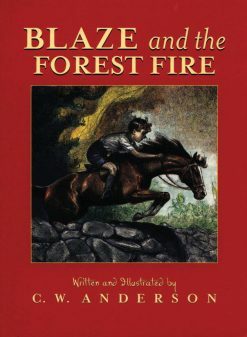 In Blaze and the Forest Fire, Billy and his pony Blaze are riding through the green woods one day when they notice a small flame in the brush quickly spreading to become a raging forest fire. Billy and Blaze race to warn the countryside. They jump high walls, leap over brooks, and plunge over barbed wire fences. Together, Billy and Blaze are able to warn the local farmers of the danger in time to put out the fire. Billy and Blaze are celebrated as heroes and rewarded for their bravery! Ping the duck lives on a boat on the Yangtze River with his father, mother, two sisters, three brothers, eleven aunts, seven uncles, and forty-two cousins. Every day, Ping and his family march across the a little bridge to the shore, and every night, they come back home. The very last duck across the bridge gets a little spank on the back. 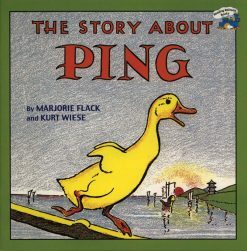 One night, Ping gets to the boat late, and to avoid a spank for being the last duck, Ping decides to stay out. Ping explores the river and gets into trouble as he tries to find his way home to the boat and his very big family. Three hungry soldiers on their way home from war convince a crowd of stingy villagers that soup can be made from stones. The villagers fetch a giant pot, and the soldiers throw in three stones. The villagers are so excited to taste this miraculous soup made from stones that they continue to add more and more ingredients as the soldiers suggest them. At last, the soldiers and the villagers feast on stone soup and celebrate late into the night. 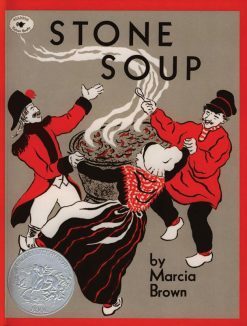 The soldiers sleep in comfortable beds that night and continue on their way the next morning, leaving behind the villagers who are grateful to have learned the wonderful recipe for stone soup. 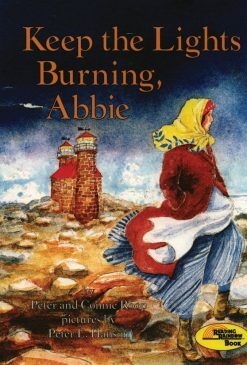 Set in 1856, Keep the Lights Burning, Abbie tells the story of Abbie Burgess who lives with her father, mother, and sisters on Matinicus Island in Maine where they tend a lighthouse. When Abbie's father must sail to the mainland to get food for the family, oil for the lighthouse lamps, and medicine for his wife, a terrible storm blows up. With her father away, Abbie must keep the lighthouse lamps burning and take care of her family all by herself. It is very hard to keep the lamps lit during the storm, and Abbie must be very brave. After two weeks the storm subsides, and Abbie's father is able to get back to the island. The children are thrilled that their father is home, and he is so proud of Abbie for keeping the lights burning all on her own. 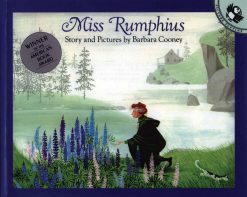 Miss Rumphius by Barbara Cooney received the American Book Award in the year of publication and tells the story of Alice Rumphius, who wants to travel to far away places, settle down to live by the sea, and do something to make the world more beautiful — just like her grandfather taught her. Miss Rumphius travels the world seeing islands, mountains, and deserts then comes home to live in a house by the sea. She still wants to do something to make the world more beautiful but doesn't quite know what. Then one day, her garden full of beautiful blue and purple and rose-colored lupines give her a wonderful idea! Soon Miss Rumphius is planting fields of lupines all along the coast. When the flowers bloom in the spring, Miss Rumphius knows she knows she has fulfilled her wish and made the world just a little bit more beautiful. 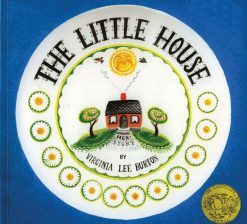 The Little House by Virginia Lee Burton was the Caldecott Medal winner in 1942 and has continued to enchant generations of readers. On a hill in the country with apple trees all around, a tiny pink house watches the seasons change. She watches trees blossom in the spring, apples ripening in the summer, leaves changing color in the fall, and children skating in the winter. At night the little house notices the far-away lights of the city and wonders what it would be like to live there. Slowly, the lights grow closer. A road is built, then shiny new cars zip past the house. More homes begin to appear, then bigger buildings, stores, and sidewalks surround the the little house. The little house realizes she is living in the city! Now, she can't even see the sun or moon because of the bright city lights and she misses the daisies and apple trees. One day a woman recognizes the house as the one belonging to her great-great grandfather. The woman decides to move the little house out of the city and back to the country. The little house is lived in and cared for and so happy to be back where she belongs! 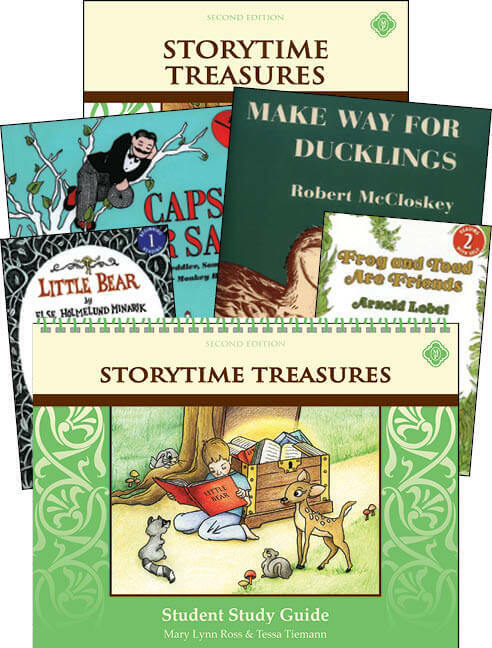 This follow-up to StoryTime Treasures will continue to increase your child’s vocabulary, reading comprehension, and grammar skills through the study of seven more classic readers. 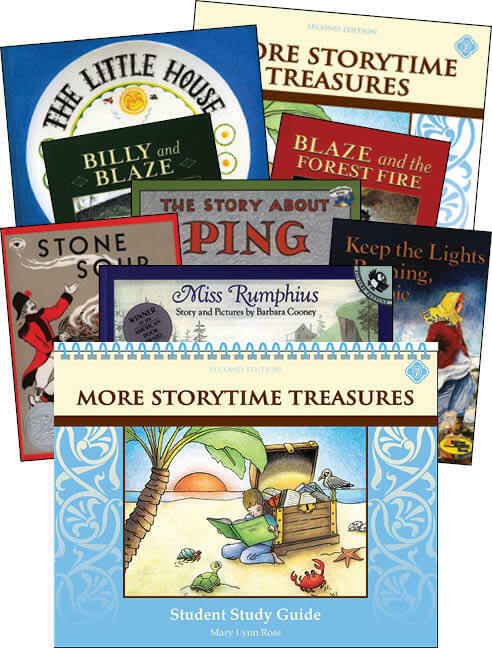 Books to be read along with More StoryTime Treasures include Billy and Blaze, Blaze and the Forest Fire, The Story About Ping, Keep the Lights Burning, Abbie, Stone Soup, The Little House, Miss Rumphius. 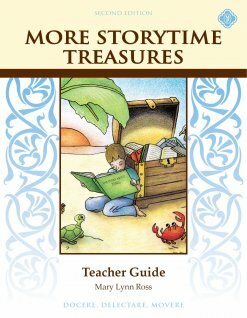 The More StoryTime Treasures Teacher Guide gives you all the answers to the questions, vocabulary, and activities found in More StoryTime Treasures, as well as essential and recommended phonetic activities for every lesson, so you have the tools you need to guide your student through this first grade literature program! More StoryTime Treasures Set is designed to follow the introduction to our varied literature reading program, StoryTime Treasures. 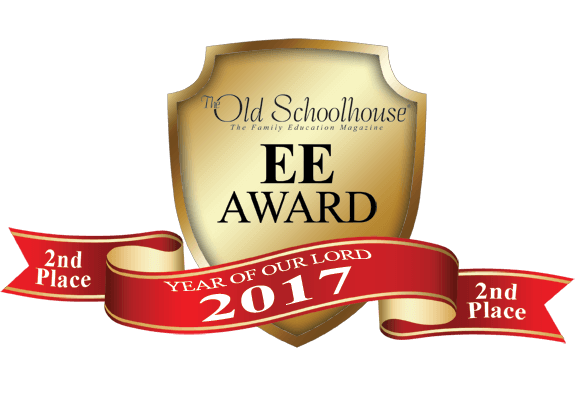 With this continuation, students gain the valuable, needed practice honing their phonics skills and decoding skills with the characters and story lines of select classics. It takes much practice and phonetic support in first grade for the student to become a fluent reader. With information provided in the More StoryTime Treasures Teacher Guide, students will have practice with the phonics needed to read the text. 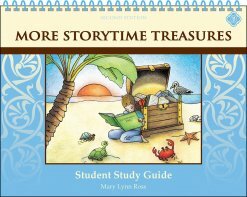 All phonetic support to aid in student success is included within the More StoryTime Treasures Teacher Guide. The covered preparatory skills are not for mastery learning but rather exposure to the more advanced phonograms students are seeing in their literature. We continue to introduce advanced phonograms to keep reading progressing. Need Lesson Plans for First Grade Reading? I had a really struggling reader. After doing almost the first half, he went from below grade reading level to at grade reading level (up two levels). Really pleased with this program and the books. I had a really struggling reader. After doing almost the first half, he went from below grade reading level to at grade reading level (up two levels).